New designer materials could eventually lead to "perfect lenses" for optical devices, able to focus on features smaller than the wavelength of light. These "metamaterials" are composites that can tap into a range of magnetism scientists cannot harness using known naturally occurring materials. 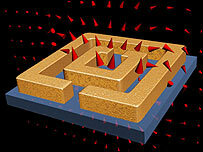 The new composites are constructed using nanotechnology to build tiny circuits on a plate made of quartz. Details of the work are outlined in the latest issue of the journal Science. The newest metamaterials respond in the terahertz frequency range which lies between infrared rays and microwave rays and can be made from elements, such as copper, or compounds which are not in themselves magnetic. Electromagnetic radiation has an electrical and a magnetic component. But conventional optical lenses used in cameras, telescopes and microscopes respond to just one of the two possible fields - the electrical. 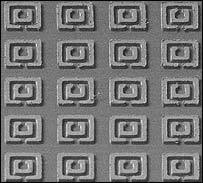 This is because almost all materials are magnetically inert at optical frequencies. "It's a bit like riding a bike with one hand," Professor John Pendry of Imperial College, London, UK, told BBC News Online. Harnessing the electrical and magnetic components at optical frequencies could therefore lead to perfect lenses with vastly better resolutions than conventional optical types. These lenses could focus on features smaller than the wavelength of light and would be limited only by the materials they are constructed from. "The march of magnetism towards the visible will enhance our power to control and use electromagnetic radiation in these frequency ranges," Professor Pendry explained. But scientists concede that pushing these new metamaterials into these frequency ranges is still some way off, if it is in fact achievable. Some experts in the field seriously question whether it is possible to develop materials capable of perfect lensing at optical frequencies. "Theoretically if you construct the elements we've made at terahertz frequencies, make them even smaller and then scale them up to optical frequencies, you could have perfect lensing at those frequencies," said co-author Dr Willie Padilla of the University of California, San Diego. "But there are theoretical limits to how these things work because you're scaling them smaller and smaller. "Once you get to the point where this material is just a few atoms thick, it's not even clear how that material is going to behave." The new materials are based on a design known as the "split ring" structure. This split ring makes a circuit which can be tuned to achieve the desired magnetic response. More immediately, the terahertz technology will open up a range of new applications. Scanners in this frequency range are thought to have great potential. Up until now their uses have been limited because of the lack of inexpensive methods to generate and detect terahertz rays. "Images taken using terahertz rays have good contrast between similar density objects," explained co-author Willie Padilla. "So when building aircraft, terahertz scanners could be used to image aircraft components, even if the components were of similar densities. "Also, terahertz is useful for medical imaging and has the advantage that it is much less damaging than X-rays, because it consists of non-ionizing radiation." The composites are also likely to see applications in enhancing the storage capacity of CDs and DVDs and in increasing the number of circuits that can fit on computer chips.